Major Cities : Ludhiana, Moga, Jalandhar, Nawanshahr, Amritsar, Patiala, Ajitgarh, Bathinda. 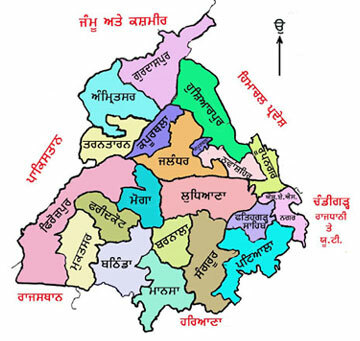 Punjab ( Punjabi : ਪੰਜਾਬ ( help · info ), Hindi : पंजाब) ( pronounced /pənˈdʒɑːb/) is located in North-West of India at 35° Latitude and 74° Longitude, blessed with plain and fertile soil receiving an average annual rainfall of 503 mm. Talking about Borders :- to the north, Himachal Pradesh to the northeast, Chandigarh to the east, Haryana to the south and southeast and Rajasthan to the southwest as well as the Pakistani province of Punjab to the west. The state capital is Chandigarh (the beautiful city), which is administered separately as a Union Territory because it is also the capital of Haryana.The history of Punjab goes back to the times of Indus Valley civilization or the arrival of the Aryans. Lord Rama is also said to have been born at a place called Ghuram, now in Patiala district. Lord Sri Krishna delivered the immortal message of the Gita at Kurukshetra, which was well within the boundary of Punjab till very recently. Taxilla University, a great institution of learning in the past, with scholars like Charak, one of the founder of the Ayurvedic branch of medicine, Kautilya, the author of Arth-Shastra to name a few hailed from this place. Taxilla University is believed to have been situated to the east of the Indus in the modern district of Rawalpindi now in Pakistan. and 3rd most popular language of Canada. The land of Punjab is very fertile. It is also known as Golden Harvests. The State Animal is Blackbuck. The state tree is Indian Rosewood. The highest no. of cars ownership per 1000 population is Chandigarh with 82 cars/1000 people. The climate of Punjab is diverse, i.e., very cold in winters and very hot in summers. biggest producer of Wheat in India. There are several other large scale industries. recorded that farmers made up 39% of Indian Punjab's workforce. Major festivals of Punjab are Lohri, Basant, Baisakhi and Teej. Punjab is most safe and prosperous state in India. Big fat Punjabi wedding. If you have never experienced a punjabi wedding then you are missing out the energetic bhangra dance, the best food, alcohol, music and relatives converge for at least a seven day long party. Punjabi's are known for their hospitality and their lion heart courage throughout the nation. India is unbeaten in kabaddi, Thanks to our Punjab region. Kila Raipur Sports Festival, popularly known as the Rural Olympics, is held annually in Kila Raipur (near Ludhiana), in Punjab, India. Punjab represents about 1.6 percent of the area and 2.39 percent of the population of the country. Himachal Pradesh and eastern Pakistan.